De Vliegende Hollander is an excellent roller coaster in Adventure Realm and one of the best attractions at Efteling. The minimum height to ride is 47 inches. It is a themed attraction which excists in different parts, based on the mysterious myth about the gost ship: De Vliegende hollander (The Flying Dutchman). The attraction contains a walkthrough, dark-ride, watercoaster and splash area. The story is about captain Willem Van Der Decken. He was a captain of one of the trading ships of the Verenigde Oostindische Compagnie; VOC (East India trading Company). The VOC was trading with Dutch colonies, such as indonesia. lots of herbs and building materials were shipped to Holland, but also illegal treasures were hidden inside the VOC ships. Captain Willem Van Der Decken was a wealthy man, but he lived a double life. On one side he was the captain of a profitable trading ship. But on the other side, he collected treasures by sectretly shipping them from the far East to the Netherlands. On the 16th of April in 1678 he wanted to sail out with his ship, against all rules and laws. "I will be sailing, even if it is for eternity". The captain sailed out and since that day, he and his ship are cursed to sail the seven seas untill the end of time. The following information can be a spoiler for those who want to be surprised by the attraction and the experience of it. The first area is a walkthrough/waiting area where you can see scenes out of the story. Here you will walk trough the burned house of Captain Willem Van Der Decken. His house is large but robbed. In the library you will see a mirror. time and time again Willem van der Decken appears in this mirror while he is reading his letter to his wife Catharina. On the desk beneath the mirror you'll see this letter, written by Willem to inform his wife that he is sailing whatever happens. On the wall there is a large painting with an opening in it. Trough this secret passage you will enter another world, where Willem stores his smuggled treasure from the far East. Willems ghost is still around. Once in every while the ceiling starts to burn again and Willem screams that whatever the rules are, it doesn't mather is it's easter, what he wants, happens. He will be sailing even if it is untill the end of time. After that secret passage you will walk through an old alley, into some Dutch warehouses alongside the dock. Passing a local pub and a storage, you will enter the dock. The dock looks like a romantic Dutch village. with warehouses from the golden age. This is where your mysterious journey begins. In sloops for 14 persons the ride starts trough a noisy dock, where sailors are busy on there ships with large sails and loaded with cannons. Wares are pulled up above your head. You will enter the open sea, in the mist. The weather changes and soon you won't see a thing. It's dark and mysterious and there is a strange breeze. Suddenly a burning ship appears in out of the mist. you will be faced with the majestic, mysterious Ghostship 'den Hollander'. Will you be able to survive your journey? The ship approaches you and everything turns dark. SUddenly the ship is right in front of you. Rain falls down and the bow of the ship lightens up. After you are gulped down, you'll fall into the underworld. You are pulled up on a 45 degrees lifthill and suddenly stopped with the sight of glowing waterfalls. Passing indiscribable perceptions, with rattling water and bombastic, terrifying music in the dark, you are facing the captain himself. Far above in the tower, uge doors open and daylight falls trough the doors. Your sloop falls down towards the water, after a turn to the right into a tunnel, over a bunnyhop, a horseshoe and with a speed of 70 km/h the ride will end in a splash. Slowly your sloop will be sailing towards the dock again, where it all started. You survived the curse of 'De Vliegende Hollander'. Most of the attraction is realised by Efteling itself. The track is designed by Kumbak and the sloops are build by Steelweld. 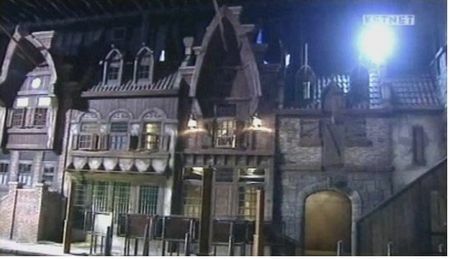 It is also the most expensive attraction ever build in the Efteling. After an investment of 20 million euros, and a delay of several months, this attraction was expected to open in the summer season in 2006. But because of the complexity of turning from darkride to coaster it unfortunately didn't open in that season. The problem with the lifthill has been solved by Intamin by putting in a break on the lifthill. The attraction opened on 1 april 2007.